You're a mushroom and truffle lover? If so, this idea is the right fit for you.In Eataly’s gift pack, dedicated to those who love mushrooms and truffles, you will find: Mushroom Risotto from Gli Aironi, which unites the delicacy of the best Carnaroli rice with the unique taste of our typical mushrooms; Extra Virgin Olive Oil with White Truffle from Tartuflanghe: the olives used for this oil's production are hand-picked and processed in an antique olive oil mill located near the Trasimeno Lake, respecting the highest quality standards. Egg Tagliolini Pasta with Truffles, the first truffle-based pasta ever produced, which gained Tartuflanghe a number of prizes and recognitions; the Dried Porcini Mushrooms from Dario Previdi: the mushrooms are picked and carefully cleaned before being cut, and are then left to relax in complete darkness. The Mushrooms in Extra Virgin Olive Oil from Masseria Mirogallo: these mushrooms preserved in oil are prepared fresh to keep their original nutritional values intact. Truffle Mediterranean Sauce from Tartuflanghe, made with mushrooms, black olives, truffles, capers, anchovies and extra virgin olive oil can be useful in the kitchen for preparing a variety of dishes. 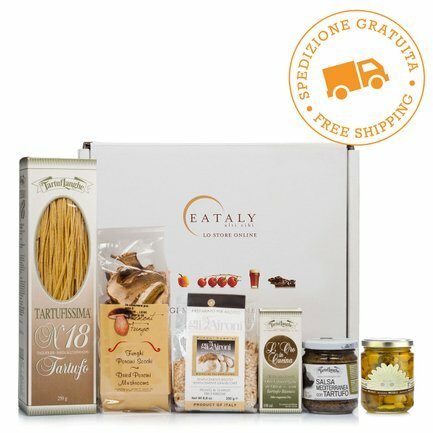 All in all, this gift pack is a true treasure to give to a special someone, or to give yourself a quality gift! 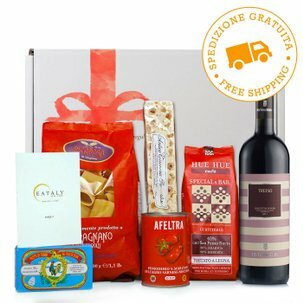 And remember that… WITH THIS GIFT PACK SHIPPING IS ALWAYS FREE! Mediterranean Truffle Sauce 180g:Cultivated mushrooms (Agaricus bisporus), olives 32%, extra virgin olive oil, summer truffle (Tuber Aestivum) 3%, capers, anchovies, flavouring, salt. Allergens: contains fish. 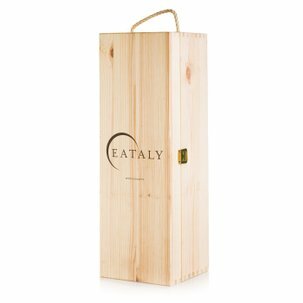 Extra Virgin Olive Oil with White Truffle 100ml:Extra virgin olive oil 99%, dehydrated White truffle (Tuber Magnatum Pico) 0.2% (equal to 1% of fresh product), flavouring. Porcini Mushroom Risotto 250g:Carnaroli rice (90%), *Vegetable stock mix, *Porcini mushrooms (3%), *Onion, *Garlic, Parsley (*dehydrated products). Tagliolini made with Eggs and with Truffle 250g:Durum wheat semolina, eggs min. 20%, black summer truffle (Tuber aestivum) 7% min., flavourings. Allergens: contains wheat, eggs. 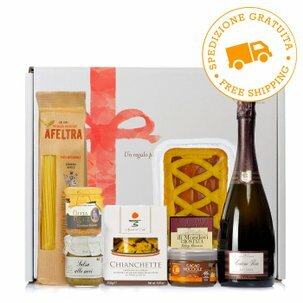 This box contains: Gli Aironi, Tartuflanghe, Dario Previdi, Mirogallo.